Ricoh, the office equipment manufacturer, has awarded CWT Meetings & Events a corporate hospitality contract following a competitive pitch. The agency, which has been briefed to manage Ricoh's VIP and corporate hospitality at the Ricoh Women's British Open, has also revealed new business from pharmaceutical firms Pfizer and Lilly, and Emerson Process Management. The wins have contributed to impressive performance at CWT with the UK business on track to double turnover this year to £27m. The firm has set itself a goal of achieving £48m turnover by the end of 2013. It plans to do this by targeting large corporate event organisers, as well as via its group travel and venue-funding services. Alison Smith, senior director of business development for EMEA, said: "Its about developing our full-service capabilities so that we are not only delivering, but leading the industry in top quality meeting and events for clients." 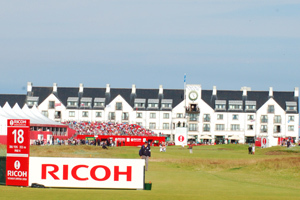 Ricoh has given CWT responsibility for event management, delegate logistics and hotel accommodation at the British Open through to 2013.